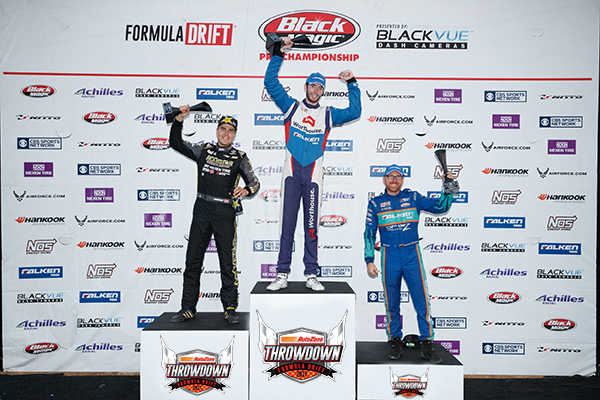 Long Beach, Calif. – July 19, 2014 – Formula DRIFT returned to Evergreen Speedway in Monroe, WA for Round 5: Throwdown. 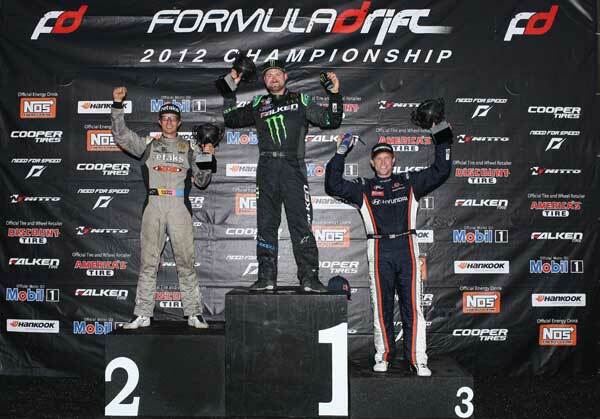 Darren McNamara in the Falken Tire Nissan S14 takes his first victory of the season. Number one qualifier, Darren McNamara faced fellow Irishman, Dean Kearney in the Oracle Lighting SRT Viper, in the finals. After a close battle, McNamara was able to take the win for his first victory of the season. This also marks the first podium in Kearney’s career. Rounding out the podium in third place was current point leader, Chris Forsberg, in the Hankook Tire Nissan 370Z, for his fifth consecutive podium of the season. 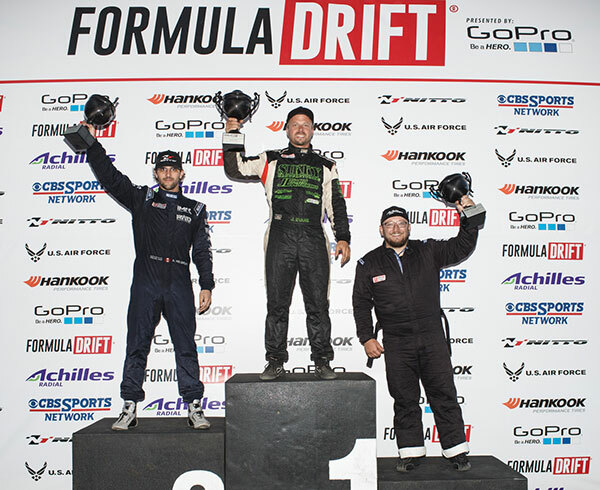 The 2014 Formula DRIFT Championship season continues to Round 6: Showdown at Texas Motor Speedway on September 12-13. For more information visit: www.formuladrift.com and find Formula DRIFT on Instagram @formulad, Facebook www.facebook.com/formuladrift and Twitter @FormulaD. Long Beach, Calif. – July 21, 2012 – Formula DRIFT returned to the Pacific Northwest at Evergreen Speedway for Round 5: Throwdown. Vaughn Gittin, Jr. in the Monster Energy / Falken Tire Ford Mustang takes his second consecutive victory and the lead in the Pro Championship Points Standings. Round 5: Throwdown continued the success of the season to a capacity crowd at Evergreen Speedway. The Driftstream saw an estimated 175,000 viewers in a 24-hour period. The action on the track showcased the true competition of the Series with many close battles and upsets throughout the event. Ken Gushi in the Greddy Performance Scion FR-S faced Hankook teammate Rhys Millen in the RMR Hyundai Genesis Coupe in a very close battle. 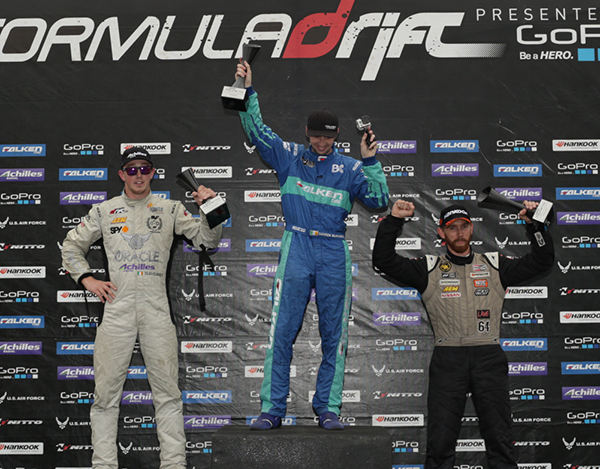 Millen took the victory for third place and his first podium appearance of the season. The Finals pitted Ryan Tuerck in the Retaks Nissan 240SX against Vaughn Gittin, Jr. After a tightly fought battle Gittin took the win and the lead in both the Pro Championship points standings and in the Tires.com Triple Crown, while Tuerck moves up to fifth place overall. The competition is as close as it has ever been with only two remaining events remaining and the championship still up for grabs. The Formula DRIFT Pro Championship Round 6: After Dark on August 24 – 25 at the Las Vegas Motor Speedway.